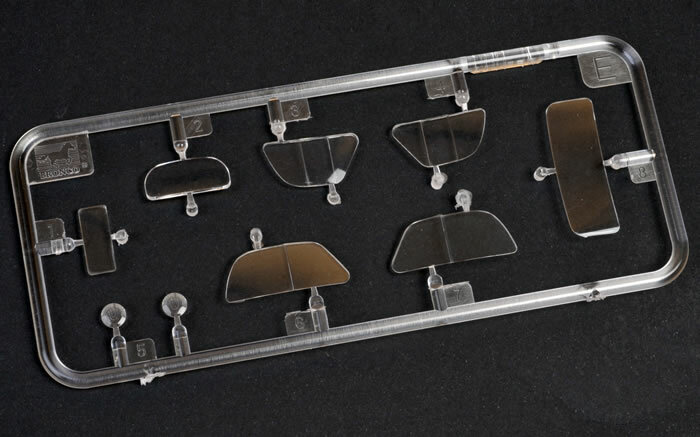 Media and Contents: 176 plastic parts, 2 photo-etched frets, markings for two vehicles. 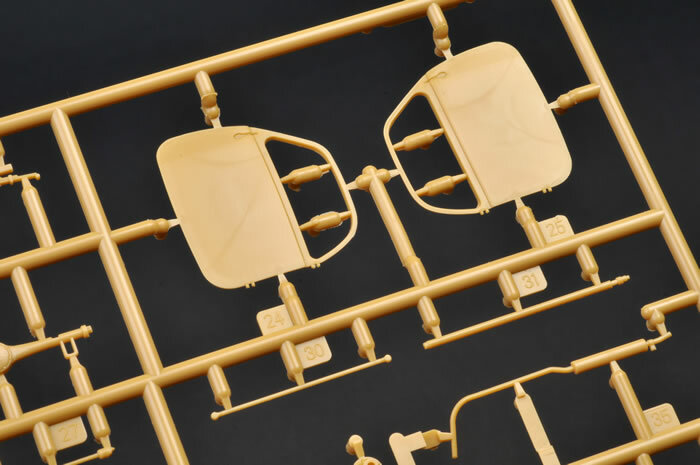 Advantages: High level of detail; beuatifully thin mouldings; optional position windows; separate doors; plenty of accessories including infantry cart, jerry cans, roof rack and figures. Disadvantages: Understated tyre tread detail; no lightening holes in chassis. A revolution shook the small car world in April 1936 and Fiat was responsible. Nothing about the Torinese car’s specification initially suggested that it would become a motoring legend. While it embodied many clever and advanced features, none of them were new. It was their realisation and the package they came in that was so remarkable. The car was the Fiat 500A Topolino and it was to become the yardstick for almost all other small cars of its day. Of course the car had its faults. It disliked cold starts was hard to maintain and the battery box was so positioned that metallic objects invariably fell into it and caused shorts. This new kit from Bronco is the fourth rendition of this vehicle release in 1:35 scale. 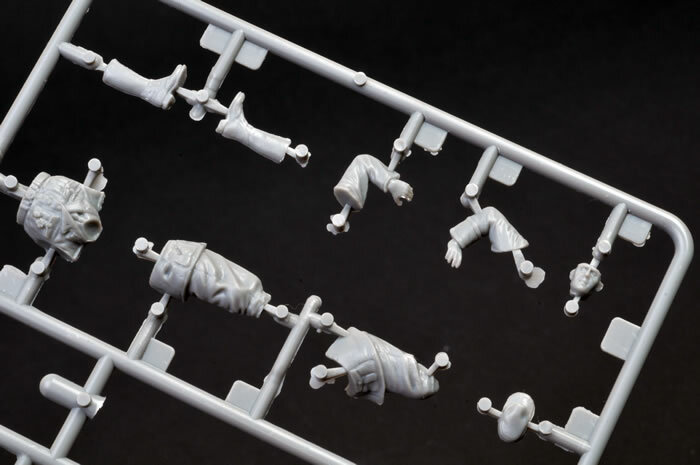 The first was the old Des Kit example and the second was the Model Victoria offering - both in resin. 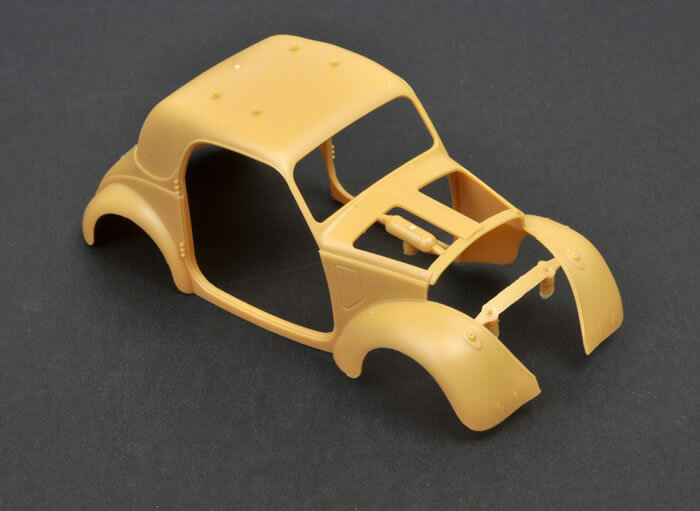 The first injection moulded plastic kit was released by Tamiya in late 2012, in the guise of a Simca 5 staff car. I therefore found it a little perplexing as to why Bronco would produce this kit. 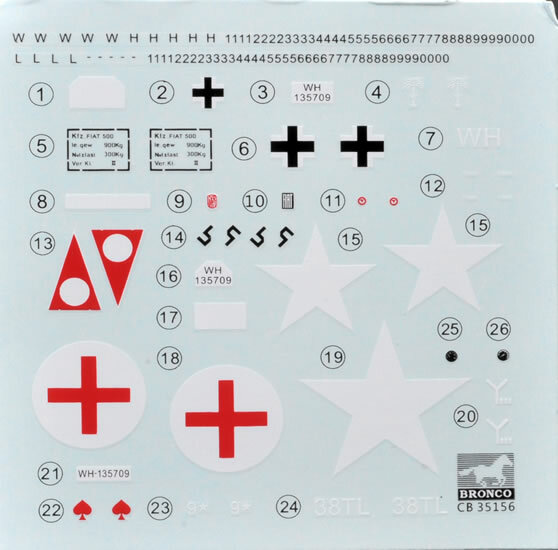 The kit is presented in a large box with attractive artwork. 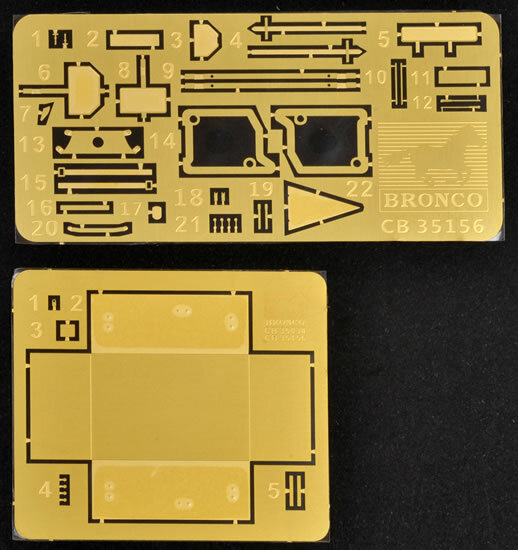 In typical Bronco fashion, a very well illustrated and precise instruction booklet is included. 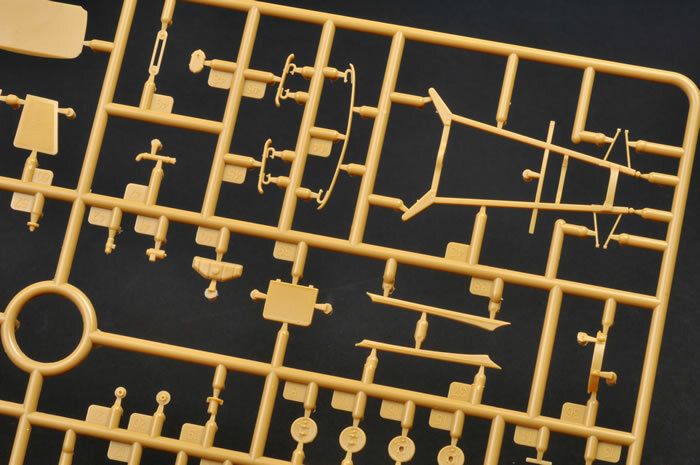 176 parts are included with 9 in clear, 16 in grey for the figures and 151 in sand coloured plastic for the vehicle itself. 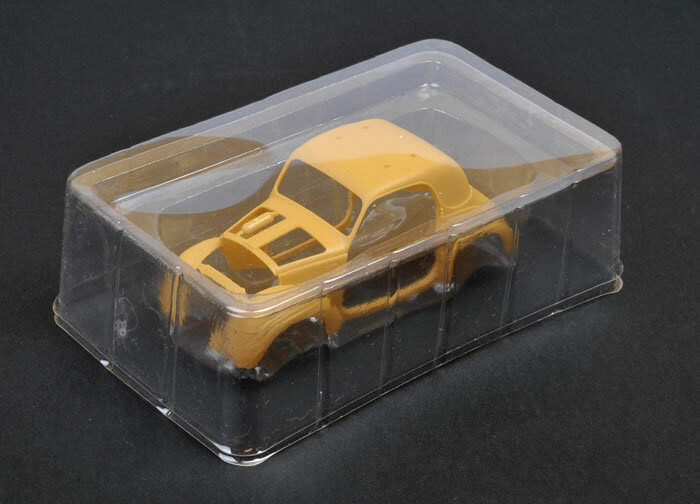 A separate upper body moulding is also included, encased in a clear plastic bubble to protect it from damage. The standard of moulding on this piece is superb. The sidewall and mudguard thickness for instance is so thin that it is almost in scale. 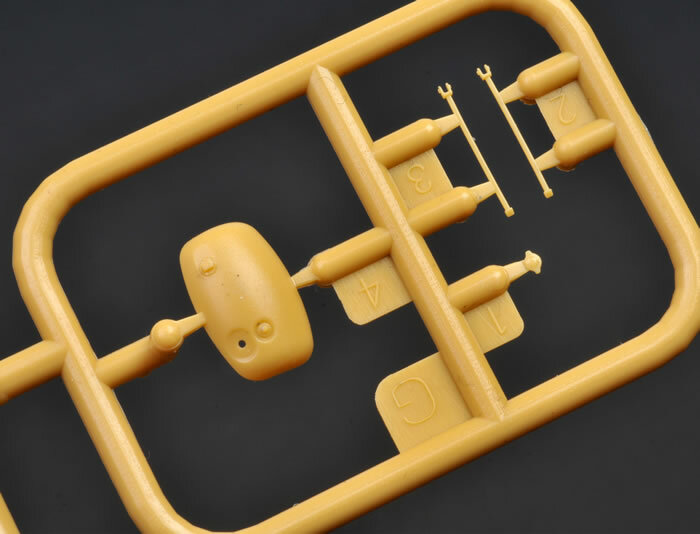 The kit’s details include a complete engine, fuel tank and radiator, two separate doors and an engine bonnet. The front half of the radiator grill/bodywork may be positioned open if you wish, exposing the engine. A lot of thought has gone into this assembly as there is detail on both sides of the radiator grille, both interior and exterior. On reflection, I would have liked the grille to be see through, but maybe I’m asking too much as I don’t think this would be possible with conventional moulding. 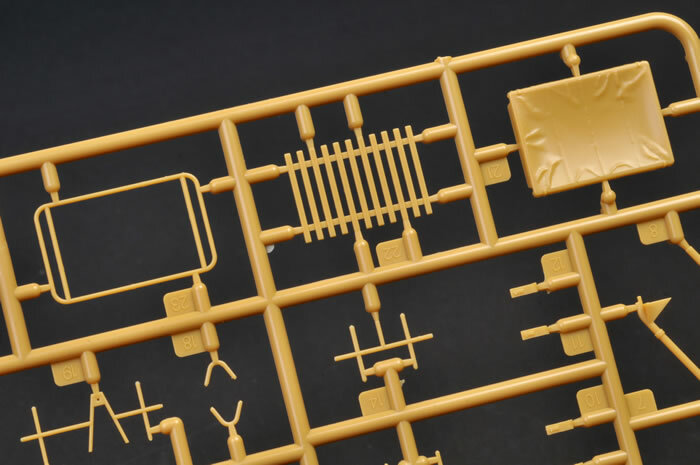 A separate chassis is included but this piece misses out on the lightening holes on the outside rails of the chassis frame. To be fair though, these were hardly seen unless the vehicle was overturned or on a hoist. The wheels and tyre assemblies are a bit of a disappointment. I like the current trend of having the tyre split down their horizontal axes with the tread pattern as flat disks. This approach offers great fidelity of detail. For this kit Bronco has taken a backward step and produced a one piece wheel and tyre combination that has the tread moulded onto the tyre itself. The tread detail is good, but just a little faint. The real problem is; even with minor sanding to remove the seam some of the pattern is lost. 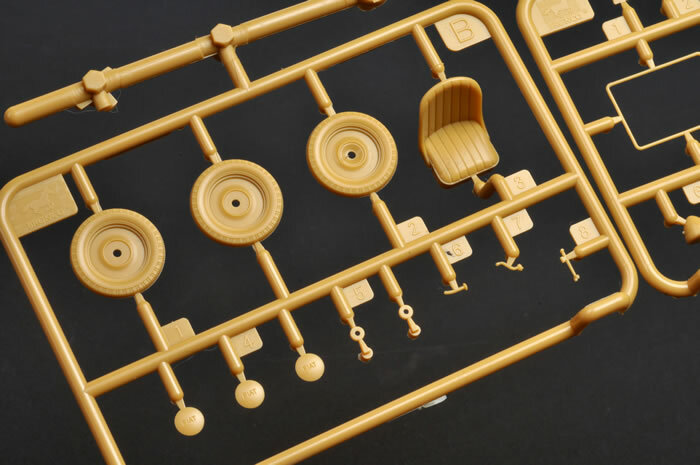 The hub caps on all the wheels are moulded separately, which will allows the modeller to have these off; but the hub nuts will have to be added if you choose to do this. 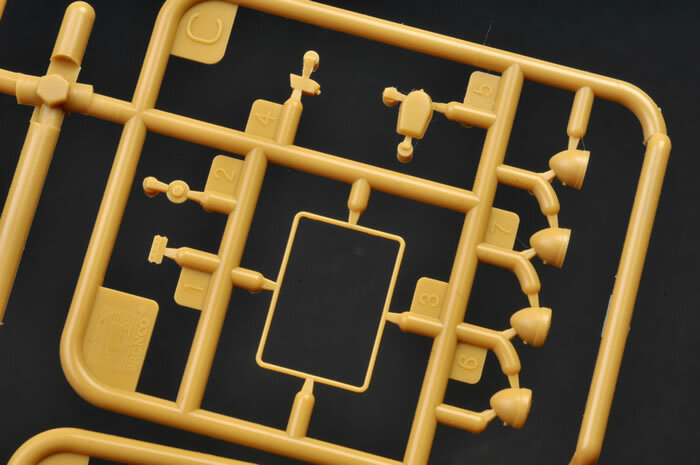 These are included on the sprue but are not called out in the instructions. 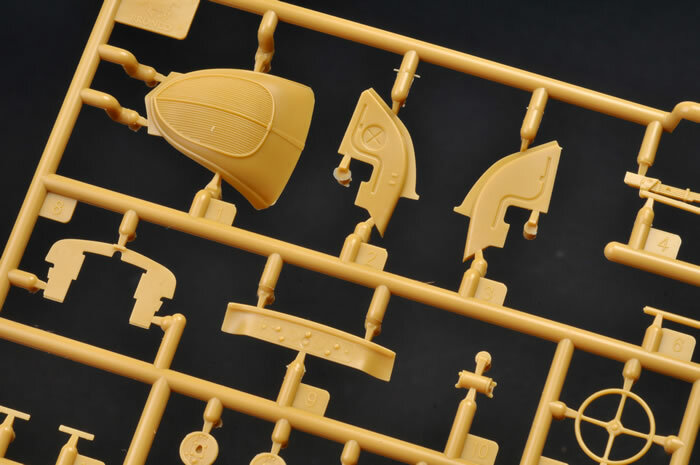 42 photo-etched parts are included that add to an already outstanding model. 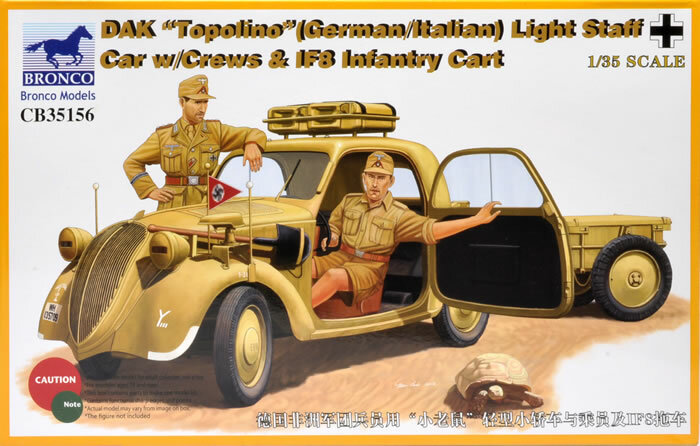 Bronco has seen fit to include the German IF8 infantry cart with this release. This is almost a kit in itself and is very well done. The tarp on the rear is finely rendered, as are the two optional wheels sets, one solid and one open. To round up this new release, two figures are included and these are some of Bronco’s best. The facial detail is very good as are the fabric folds on the uniforms. Two marking choices are offered - one captured olive drab and one Afrika Korps version. Comparisons between all the kits of this little Fiat now available are inevitable. The old Des Kit can be now relegated to the dust bin. The Model Victoria kit has some minor accuracy issues (namely the grill work on top of the bonnet) but has a superior chassis and wheels. The Tamiya kit is a fine kit and simple to build, but to my eye looks a little basic in places. In my opinion, this new kit from Bronco is the best of the four. 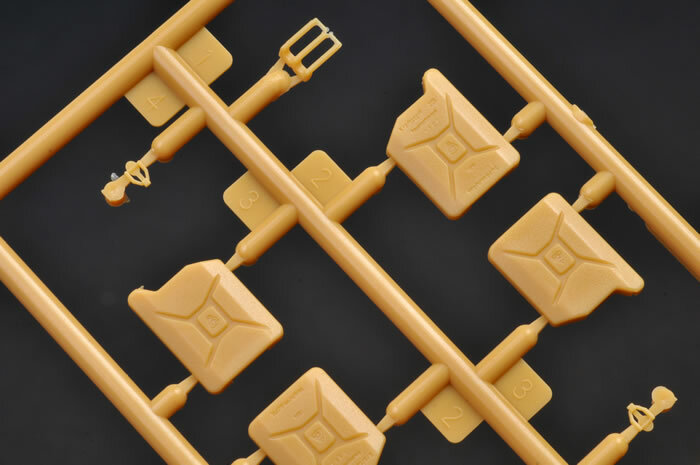 The list of accessories included is large and the overall execution of this kit is outstanding. 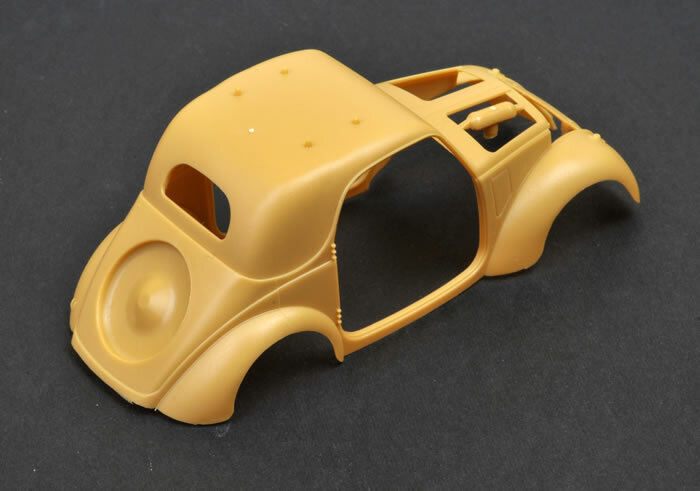 The moulding on the bodywork is a case study on how fine plastic injection moulding can be. Thanks to Bronco for the review sample.